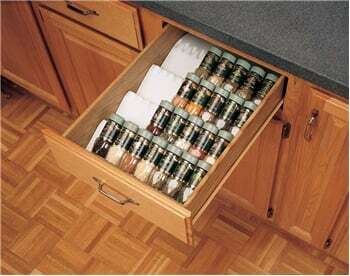 Spice Drawer Organizers. Keep your spices organized in a drawer. Drop-in Spice Tray Organizer by Rev-a-Shelf. 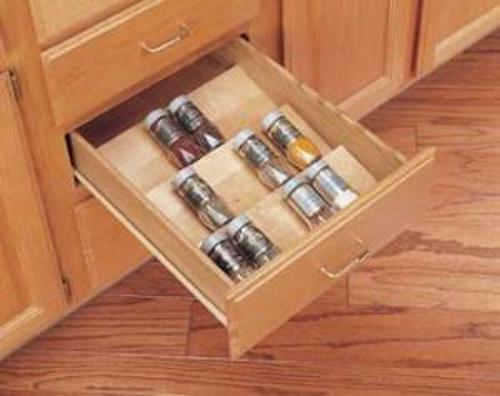 Organize your spices in a drawer near your stove for easy access. Measure, trim, and drop-in for a quick and easy organization project. Tiered design uniformly stores your spices so you can find what you need when you need it! Drop-in Spice Tray Organizer by Rev-a-Shelf. Organize your spices in a drawer near your stove for easy access. Measure, trim, and drop-in for a quick and easy organization project. Tiered design uniformly stores your spices so you can find what you need when you need it! Available in maple hardwood which as been coated with UV-Cured clear finish that is suitable for any cabinet finish or Glossy White Polymer. Spice Drawer Insert are made of birch/maple hardwood, with a UV-cured clear coat finish that allows an acceptable match to any cabinet. Spice Drawer Inserts are made of birch/maple hardwood, with a UV-cured clear coat finish that allows an acceptable match to any cabinet. Tray holds spice containers securely while keeping them easily accessibly. Unique tray keep all spice containers easily accessible, even in the back rows. Simply drops into wood or metal drawers.